Gorilla trekking is a popular activity termed by most of visitors to Africa to be must do, it is only done in the Eastern and Central Part of the African Continent in the Countries which host these shy endangered Mountain and Lowland Gorillas in their habitats, these unique countries include Uganda “The Pearl of Africa”, Rwanda “The Land of a thousand hills” and Democratic Republic of Congo. The African gorilla trekking safari activity is the same but it differs in requirements needed to participate in depending on different gorilla hosting destinations. This is the most prominent activity done in Uganda because it’s one of the major Gorilla hosting destinations in Africa, it is indicated to be hosting most part of the World’s Gorilla population in its natural habitats. Uganda strategically located in the Eastern part of the African Continent hosts only mountain gorillas species and these species are found in two major national parks named Bwindi Impenetrable National Park and Mgahinga Gorilla National Park. Of the two destinations Bwindi Impenetrable National Park is listed to be hosting the most part of Uganda’s gorilla population with over sixteen gorilla families in its sectors, Bwindi has four sectors where these ground dwelling apes live, feed and sleep which include Ruhija sector, Rushaga sector, Nkuringo sector and Buhoma sector. These sectors named and located in different corners each has more than two gorilla families for trekking apart from Nkuringo which only has one gorilla family for trekking. Bwindi Impenetrable National Park is located in the South Western part of Uganda characterized with a thick impenetrable forest where these herbivorous apes reside, you can only reach it by use of Kampala- Masaka – Mbarara highway with en-route stop over at the equator for some brief explanations about the equator by the officials, photographs and snacks then continue with the journey up to the Park, it’s about 8-9 hours’ drive from Kampala up to Bwindi and when you reach there is a gazetted place where cars are parked and the rest of the Park is accessed on foot. Mgahinga National Park is the second gorilla hosting destination in Uganda if not the popular Bwindi Impenetrable National Park, it hosts the least number of Gorilla species with only one gorilla family for trekking named “Nyakagezi Gorilla family”, it is also located in the South western part of Uganda nearing Volcanoes National Park of Rwanda and Virunga National Park of Democratic Republic of Congo inclusive of the Virunga Massif. Mgahinga is characterized with tropical rain forest, Savannah grasslands and Bamboo forests where Golden Monkeys are residents. Trekking Gorillas in Bwindi impenetrable and Mgahinga National Park you are required to bring yourself strong hiking shoes which are impenetrable by thorns and hooks, water proof jackets and bags to protect you and your electronic gadgets from water in case of rainfall, huts, insect repellents, sunglasses plus buying a gorilla trekking permit which costs $600 USD per person booked in advance and valid for one day. 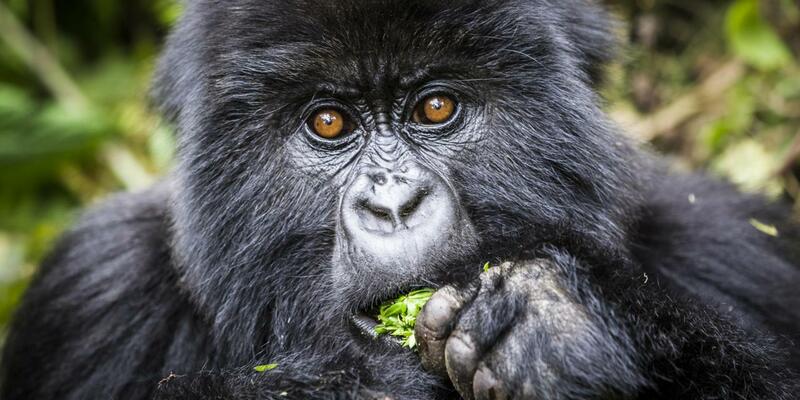 This was the driving force of Rwanda’s tourism before an increment was done which led to a slight down fall in Rwanda’s mountain gorilla trekking. Rwanda also has one type of Gorilla species named “Mountain Gorillas” which are only found in the popular Volcanoes National Park, this Volcanoes National Park is located in the North western part of Rwanda characterized with tropical rain forest, Savannah grasslands and Bamboo forests where the popular Golden Monkeys are residents, Volcanoes National Park is near when compared to other Gorilla hosting destinations and you can only reach it by use of road transport means which is about 2-3 hours’ drive from Kigali to this Park. It is in the second position as far as number of Gorilla species hosted with over twelve Gorilla families for trekking, not only gorilla trekking but also characterized with different features like Volcanic Mountains which include Mountain Karisimbi, Mountain Bisoke and Muhabura plus an adventure of hiking up to the Dian Fossey Grave yard. On your Gorilla trekking journey in the forests of Volcanoes National Park you will also sight other Primates which include Monkeys (Black & White Colobus, Blue, Red-tailed, Vervets and Baboons), insects like Butterflies, Mosquitoes, Reptiles like Black Cobra, Python, Gabon Viper, different bird species including the rare shoe bill and different Species of trees. The permit for trekking the shy endangered herbivorous and ground dwelling Mountain Gorillas costs $1500 USD per person booked in advance but seems to be more expensive when compared with that of Uganda and Democratic Republic of Congo. Among the three Gorillas hosting destination Democratic Republic of Congo tends to be unique with both Gorilla species named Mountain Gorillas and Eastern Lowland Gorillas which are strategically habituated in two different destinations located in different corners of Democratic Republic of Congo. 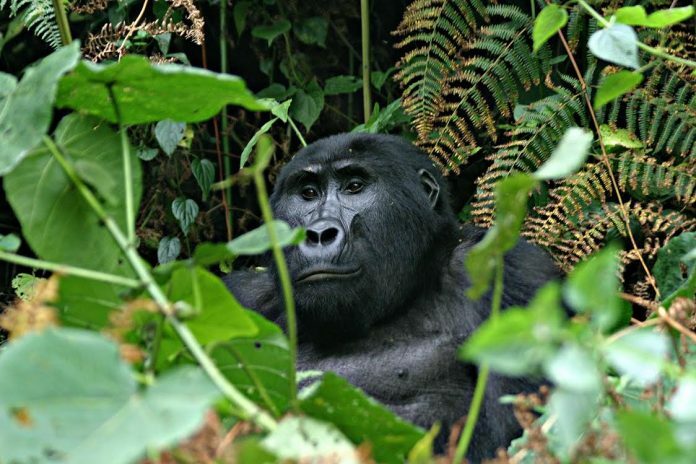 These Gorilla hosting destinations in DR Congo include Virunga National Park which hosts the shy endangered ground dwelling Mountain Gorillas and Kahuzi Biega National Park which host the brownish Eastern Lowland Gorillas. Virunga National Park is the only place to go for Mountain Gorillas in Democratic Republic of Congo; it is ranked to be the oldest National Park in Africa formerly called Albert National Park. This destination is located in the Eastern part of Democratic Republic of Congo bordering Volcanoes National Park of Rwanda in the East characterized with tropical rain forest, Savannah grasslands, Swamps and some parts covered with bamboo forests where these apes reside, over six habituated Gorilla families are found in the thick forests of Virunga National Park. Virunga is also well stocked with different Primates and Species which include Black & White Colobus Monkeys, Blue Monkeys, Red tailed Monkeys, Vervets, Baboons, different bird species which are sighted while on the trekking journey in the Jungle. Kahuzi Biega National Park is another destination to visit in Democratic Republic of Congo only characterized with Eastern Lowland Gorillas which are brownish in color, tailless and bigger than Mountain Gorillas when compared, it is characterized with tropical rain forest, Savannah grasslands and some areas occupied by witty Swamps. 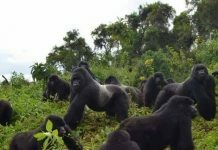 Gorilla trekking Permit in Democratic Republic of Congo costs $400 USD per person booked in advance before your trekking dates, this is rated to be the cheapest when compared to that of Uganda and Rwanda.